Here's a book for beginners who want to focus on creating concept sci-fi and fantasy art. 3DTotal Publishing has published several beginner books on digital paintings, such as one for characters and the Digital Painting Techniques series, but this is the first book that focuses solely on sci-fi and fantasy art. The get the best out of this 224-page book, you do need to know your way around Photoshop first. From what I can see (and guess), it looks like they are using CS6 or newer Photoshop in this book. Anyway, the key features are usually available through the versions. This book does give you additional shortcuts when it comes to using the Photoshop. What included are full length step-by-step projects to follow along. What's good about the book is it talks about art fundamentals like composition, using colours and other important principles, and how you can reproduce those digitally. It provides the explanation so that you're not just following blindly. Half the book focuses on characters, there are also projects on environment art, and mini tutorials on creating props, textures and other effects. 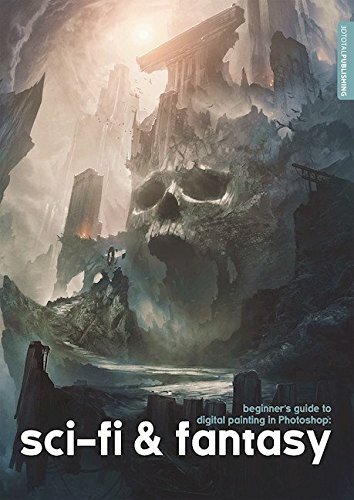 This is worth the money because if you're serious about digital painting, for the price of this book, you can get to learn from the pros and develop your skills faster.